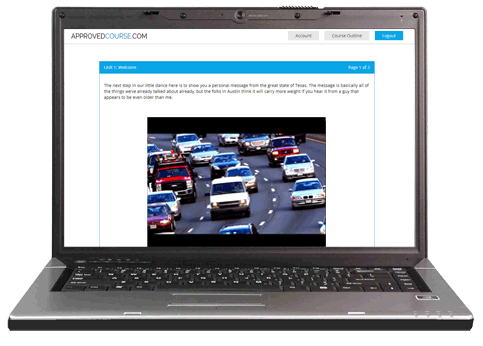 Illinois Adult Drivers Ed Course - Fast, Easy and 100% Online! The easiest way for adults 18-20 to get an Illinois drivers license. All drivers 18-20 in Illinois must complete a drivers education course before applying for a license. Our course meets all of the state licensing requirements, and our online instruction gives you the convenience to learn at your pace and on your schedule. ​All this and more in the convenience of an online course that is completely under your control. You can learn it a few minutes a day, or you can power through six hours of study all at once. The choice is totally up to you. No more classes, listening to long, boring lectures. Online instruction gives you the flexibility that your busy lifestyle demands. Log in at your favorite internet bar, coffee shop, or at home, and on any device. Your education is completely under your control. Finding the time to take a drivers education course can be difficult. With our online service, you can learn at you convenience, according to your busy schedule. it couldn't be better. Just because you have to take an Adult Drivers Education Course, it doesn't have to be mind-numbing. Our instructors and education professionals have developed a system of combining information, videos, animations, and a little comedy that will engage and entertain. This maximizes your knowledge retention and allows you to learn the required information easier than ever. Our information is current and complete. You've never had a better opportunity to take an Illinois Adult Drivers Ed course - all on your schedule. Once you complete the last unit of our course, you will receive an e-mail from the Illinois Secretary of State instructing you how to download and print your certificate. Then you're done! We offer the most convenient course approved by the Illinois SOS!